At 11pm on September 6th, 1776, Sargent Ezra Lee began cranking away on a lever that propelled the tiny submersible that he sat inside of. His goal was to make his way to the British Flagship HMS Eagle and attach a crude explosive charge to it, then make haste (at 2mph) safely out of the area. 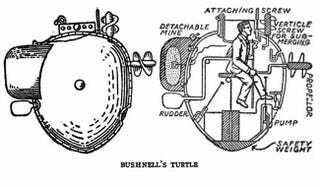 This is the story of the American Turtle, the world's first submersible used in combat. Built in Connecticut with the direct approval of General George Washington, the Turtle's inventor and underwater explosives guru turned patriot, David Bushnell, realized that stealth could be obtained just at and below the waterline. In many ways the Turtle was a super-weapon development program of its day. Before the Declaration of Independence was in the King's hands, America was looking for anything it could use to take on the crushing might of Britain's overwhelming military capabilities. The Turtle was named so because of its shape, like two shells mated together, and for its maritime mission. It measured just three feet wide, 10 feet long and 6 feet tall. It could accommodate one man, which would provide navigation via a small rudder and propulsion via a hand-cranked propeller. It remained water-tight via covering the whole vehicle, mainly built out of oak, in hot tar and running tight steel bands around it. The rudimentary sub dived by allowing water to pour into a bilge tank at the bottom of the vessel, and it could surface via pumping out that water via a hand-cranked screw pump. In case of an emergency, such as a crack occurring in the boat's hull, there was 200lbs of lead that could be released on command, which would allow the humble little sub to shoot back up to the surface. There was only enough air inside Turtle for one crewman to survive for 30 minutes. There was a series of glass port holes on the top of the Turtle where its hatch met its hull. These provided light during daytime operations and a very basic view for navigational purposes. Since she would mainly operate at night, and a flame would asphyxiate her single crewman, internal illumination was provided by a cork that was covered in bioluminescent fungus. Although the idea was to keep Bushnell's attack sub secret, a spy working for New York Congressman James Duane outed its existence to the Royal Governor of the Province of New York. After completing trials in both Connecticut and off Long Island, Turtle was transported to the Hudson River for its debut attack on the British Fleet moored there. On that late summer night in 1776, Sargent Lee slowly fought his way toward the HMS Eagle, which was moored south of Manhattan Island, after being towed out a ways from shore by row boats. The whole mission seemed in jeopardy as Lee's progress was almost non-existent until the current began carrying him toward his objective. Once within clear view of HMS Eagle, he slowly submerged and crept underneath the big ship's stern, towards its rudder area. Here begun his attempt to drill into the Eagle so that the explosive package could be attached. Exhausted, Lee kept trying to break through what seemed like an impenetrable metal barrier (later it was thought that this was the iron plating around the ship's rudder hinge system). He then tried to submerge directly underneath the Eagle but the clumsy little sub had issues with staying in one place under the big ship's curved hull. Lee eventually gave up on the attack, and made his way back out into the Hudson channel. He says that he was spotted by the British as he left, and that multiple teams of sailors rowed out to investigate the strange object in the water. Lee then released the explosive charge, which was an elaborate timed device that used a fragile flintlock ignition system, to distract the search teams. The teams gave up long before the charge went off, which Lee said resulted in a massive explosion sending water high into the air. Another attempt was made on October 5th that would see Sergeant Lee trying to attach a similar charge, which he called Torpedo incidentally, to a British Frigate also anchored off of Manhattan. He claimed that he was spotted on his approach to the ship so he aborted the mission. A few days later the Turtle was sunk as it sat atop its tender vessel near New Jersey. The British saw it and engaged it without a fight, supposedly blowing it to smithereens, although Bushnell claimed he salvaged parts of it. Today there are a few replicas of the American Turtle at various maritime museums, yet a semi-accurate functional version of the Turtle actually made news in 2007 when Brooklyn artist Duke Riley took his unannounced replica of the famous sub into the Hudson River and made his way towards the iconic and giant oceanliner Queen Mary 2 that was moored near Red Hook, Brooklyn. Duke and his ominous looking Turtle were intercepted by Police and Coast Guard who were perplexed at what they saw. Eventually they realized that there was no terrorism objective to Mr. Riley's mission and they impounded his home-built replica and cited him and a couple of friends for operating an unsafe craft, along with some other smaller infractions.